Are we just scared of each other? 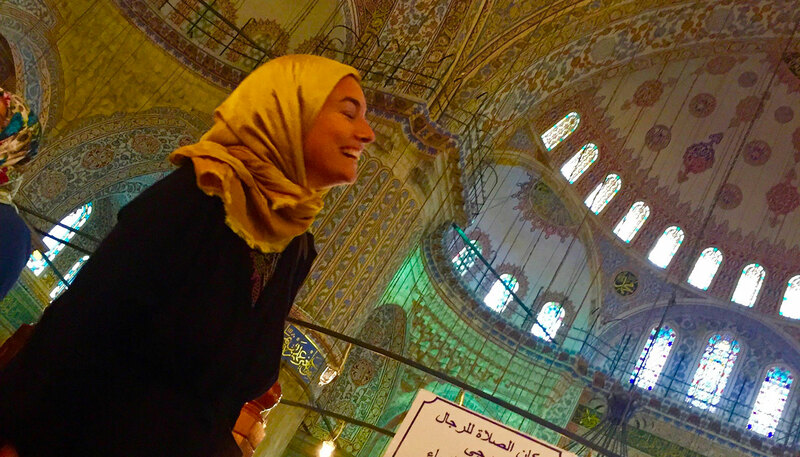 Overcoming fear by coworking in Istanbul. Why we need to unite our cultures as our soul depends on it. I’ve always been fascinated with Turkey, yet traveling there this year was not encouraged. Our politicians, the effect of war, and the voices from America currently have an underlying tone of fear for Islamic culture. Still, I decided to book a ticket and launch myself into Istanbul, a city that has experienced a huge shift in refugees over the last two years from more than 2.7 million Syrians and other victims of war entering the country. I kept looking at the news and the voices telling me I was crazy to go there by myself as an American woman. And maybe I am. Or maybe we are just scared to admit that we are scared of each other: men are scared of women; women are scared of men; Americans are scared of Muslims; Muslims are scared of Americans. I admit – I arrived and I was scared that others would judge me for dressing the wrong way. In fact, there were a few times I felt I needed to act as if I was from somewhere else. Why? Because it was hard to get past my own fear that refugees might judge me for being a part of America, a country that is controversial in the middle east and might of been involved with the violence that pushed them out of their homes in Syria. But can they blame me for this and can I blame them for being victims of war? I don’t believe in violence – I don’t accept or support war and I don’t believe being isolationist or cutting off our borders from immigrants will end our problems. People are people. We must get past the fear so we can build a peaceful community. This is why it also saddens me to look at our political landscape in America and see such a racist, anti-immigration policy from our politicians with the possibility of DACA (Deferred Action for Childhood Arrivals) ending in America. This stance comes from a deep fear of people. Now is the part where I bring in coworking…so I came to Turkey to cowork. I visited the most beautiful coworking spaces – Impact Hub, Kolektif House, Levent Ofis – but the people I also really started coworking with was my neighborhood. It was the coliving in Turkey in my shanti shanti house with our turtle, dog, juggling roommates and my neighbors that gave me Turkish tea that amplified this enriching experience. What I realized about being out here in Turkey is there is full-bodied culture here and I am less fearing and growing stronger. Hearing the Islamic prayer and it’s rotation now is a calming sound. I also found wearing the hibjab (head scarf) to have its benefits. I didn’t have to worry so much about what I look like. No one told me to wear this but I felt it was respectful to try and be apart of common beliefs of the culture when it felt right to do so. I also feel the Turkish people are very friendly and inviting. There is one thing that I do not like however – Wikipedia is banned in Turkey. What?! Going to Turkey and launching my global website is scary – but really the scariest thing for me is being isolated and alone. And America is going down a path of isolationism due to fear. War is fear. Racism is fear. But we can get past this. We need to weed out the fear by uniting together. Our culture, our earth and our soul depends on it. Resting more easy now. Ashley. Good to know you are out there!